Visit our webshop to buy bicycle components. They don't wear it often but the Dutch do have cycle gear! When the rain comes pouring down the Dutch suddenly show they can dress up for cycling. But of course, as with everything regarding cycling in the Netherlands the kind of gear to protect from the rain is perfectly suited for everyday upright cycling. While some people ignore the rain, most come prepared. Not always too obvious: you can just see that the man with the hat in the center wears rain pants over his light coloured pants. The man on the far right wears rain pants over his blue jeans while riding a rental bike! He really came prepared! All sorts of rain capes are worn by men and women, sometimes combined with rain pants as well. Rain suits come in all colours. The pedestrian on the far right has already geared up on his way to his bicycle. Some people rely on umbrellas, but you can question how usefull they are. The guy who stole the pink umbrella from his girlfriend doesn't really seem protected, but that's because he broke it. While most people use their umbrellas over their heads, some try to keep their legs dry. All these people can be seen in the video I shot during morning rush hour in Utrecht last week. It was one of the few mornings that the rain really came pouring down, which doesn't happen all too often*. What also becomes very clear from this video is that there are many pedestrians in the Netherlands. From my videos some people get the impression that the Dutch don't walk, but that is not true. You often don't see pedestrians because these two types of traffic are also mostly separated from each other. Just like cycling is not combined with motorised traffic. Here the two flows of traffic, pedestrians and cyclists, do meet and it shows. The main conclusion that can be drawn from this video: most of the Dutch do not stop cycling for a bit of rain. And they don't really have to in a country where it is even safe to cycle with misted up glasses and holding an umbrella with one hand. This is my last post of the year. (a Merry Christmas and a Happy New Year!). * On the site [translated] "it hardly ever rains" a man debunks the myth that it always rains in the Netherlands. After counting his rides for three years they turn out to be wet in only 11.99% of the time. He counts all rain, so the times that it really pours are even less. 0:00 : Groningen wants to become the most cycle friendly city in the Netherlands once again. 0:10 : But is the city really so cycle friendly ? The local government has much work to do to get the title. 0:20 : "For pensioners, the new Berlage bridge is a test like the Alpe d'Huez". There are many complaints. 0:30 : Fietsersbond representative: "The incline is too steep"
1:00 : Interview with people talking about the danger of the junction. "People come along quickly and it's difficult to see"
1:15 : It's not obvious and therefore it's dangerous. "I need eyes in the back of my head and in both sides", "students come along here in a hurry and don't look. The junction is dangerous." 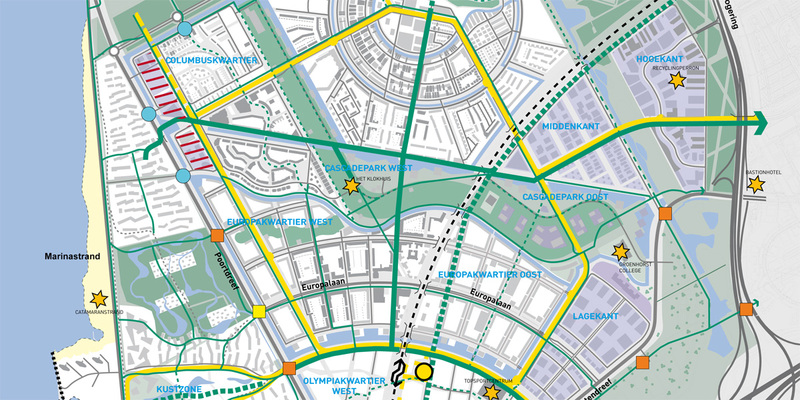 1:40 : In 2002, Groningen got the award Fietsstad 2002, but how about this time ? 1:52 : Fietsersbond representative: "I think it's impossible this time"
1:57 : The Fietsersbond also see problems in other areas of the city, including by the railway station. 2:00 : Local politician: "I've not heard of this problem of the bridge being too steep but I'll take a look"
I covered the most dangerous junction in the Netherlands a few months back. 14 injuries amongst all types of road users were reported here in three years, a better record than junctions in London and Cambridge. A test like the Alpe d'Huez ? Read more discussion of this bridge including a video of riding over it. As for the steepness of the new bridge, which of course includes separated cycling infrastructure as do all bridges, I think many readers from outside this country wouldn't see the problem here either. Oh to have such "problems". But this is quite illustrative of what has made the Netherlands the leading country in cycle usage. Nothing is ever finished. Groningen may have won "Cycle City 2002", but that doesn't mean that they can sit in their laurels and expect to win "Cycle City 2011". Many improvements have been made in Groningen in the last 9 years, but they were not enough. Other cities have done more. It's a brave person who talks of any Dutch city as a "Cycling City", as they'll soon have someone pointing out the defects, which even if they might be minor elsewhere, are of great concern here. 's-Hertogenbosch has a few lower cycling modal share than does Groningen. It's actually relatively low for any city in the Netherlands, nothing special indeed. However, what 's-Hertogenbosch has done in recent years is to make bold plans and to achieve real growth. For this reason it is far better than 's-Hertogenbosch won the prize than Groningen. Groningen has more cycling than any other place in the Netherlands, indeed than any other place in the world. But the city also has too much dated and lack-lustre infrastructure. Groningen has work to do. In Britain and America, things are entirely different. For example, in Dumfries and Galloway with a cycling modal share of approximately 3%, the local transport strategy says "Overall, cycling and walking infrastructure is considered to be of a good standard and the council consequently considers that only incremental improvements to existing networks will be required in the short term". Meanwhile, in the USA, some people think that Portland "has a great infrastructure" and that with a 4% modal share for bikes, it is second only to Amsterdam. The same "second to Amsterdam" claim was made by Cambridge in the 1990s. To make such a claim is absurd for both these cities. There's nothing wrong with positive speaking. However, they some grounding in fact is needed. While the Dutch are modest and have frustrating reluctance even to call Groningen a "cycling city" even though it has the highest cycling modal share in the world, other places in the world are keen to exaggerate relatively small achievements. For a model of what is possible, the best place to look remains the Netherlands. Campaigners in the Netherlands set their sights high and rather than hyping their cities they make clear what is not good enough and work towards fixing it. Campaigners elsewhere must also make sure that they don't set their sights too low and that they don't overly praise actions taken which not entirely positive. Doing so results in a distinct lack of progress, as seen in most other places in the world. The longest cycle bridge of South-Holland. That’s how the media introduced the brand new 600 meter (1968.5ft) long cycle bridge that was opened on 26th October last. It connects the town of Spijkenisse to the Rotterdam Port area to the north. Building had started in April 2010 and this new bridge cost 21 million euros. It was paid for by the “stadsregio” (Rotterdam metropolitan area) and the province of South-Holland. The cycle bridge is called Hartelfietsbrug (Hartel cycle bridge) because it crosses the Hartelkanaal (Hartel canal). A spokesperson called the new bridge a big improvement for cyclists because it makes cycling more convenient and safer since this bridge puts cyclists further away from car traffic than the original separated cycle path right next to the busy road on the existing bridge did. But he is also crystal clear about another reason, which is that the road for motorised traffic has to be widened from three lanes (two single lanes and one alternate lane) to a road with four lanes (two lanes in each direction). Because the road cannot handle the increasing motorised traffic. Removing the cycle path from the existing bridge gives exactly enough room for the extra lane. To a cynic or someone with a ‘glass-half-empty-mentality’ this could be seen as “proof” that the Dutch are actually car-centric and that all they want is ‘getting cyclists out of the way of car traffic’. But is that really how you should see this? Well no of course not. What you see here is how the integral transport approach in the Netherlands works. 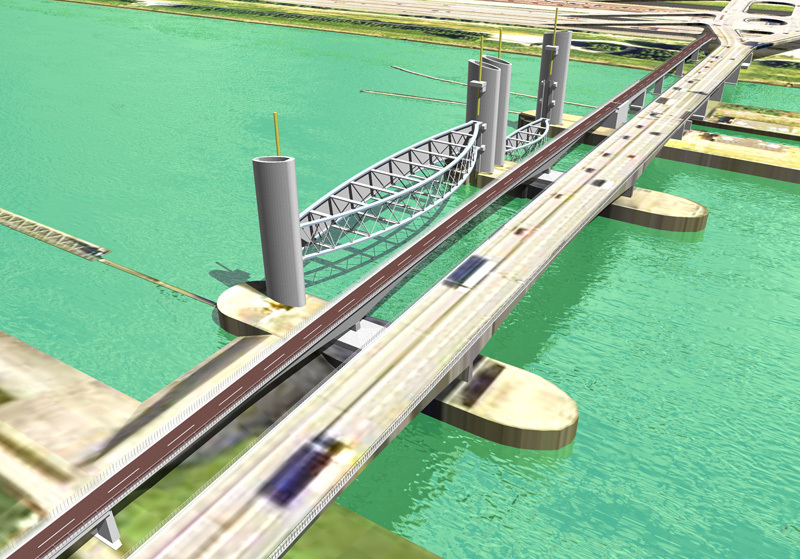 The goal of the approach is to make transportation in a region possible. Transportation has to be understood in the broadest sense of the word. Cycling is one part of it and so are public transport, professional transport and private motorised transport. If there is a problematic bottleneck in one part of the system (local) governments will look for a solution in the entire system. Improving cycling conditions can lead to less congestion so Dutch authorities do indeed build cycling infrastructure to decrease (motor)traffic congestion. Just this week a network between Rotterdam, Delft and some smaller municipalities was finished. This network of 15 kilometers (9 miles) of new fast convenient and safe cycle paths, with 12 new bicycle tunnels, was built "to reduce congestion on the roads and to contribute to a better health for the people of the province of South-Holland". See article (quirky Google translation). In this case it was thought best to build a new cycle bridge and use the room on the old bridge for the expansion of the road. Earlier I showed you an example where motorised traffic was diverted and more room for public transport and cycling was created. Hartelfietsbrug in between the storm surge barrier and the bridge for motorised traffic. Hartelfietsbrug does not look very spectacular but looks deceive. It was built in between the car bridge and a storm surge barrier. Because of the latter it was impossible to drill a foundation so the bridge was screwed on and glued to that storm surge barrier. This had never been done on such a large scale. To reach this bridge I had to cycle from the nearest railway station. Which was in Vlaardingen-Oost, about 12 kilometers away. The ride took me through the Beneluxtunnel of which you could see my video earlier. The ride took me also through the large Rotterdam port area with all the petrochemical industry. It is interesting that the large oil refineries can be reached by good cycle infrastructure. Even though it was the middle of the day so there are not many people underway, I did see some employees arrive to and leave from their work at those oil refineries by bicycle! The area is not very scenic to say the least. But I filmed the full 25 kilometer (15.5m) ride and you can see it at ten times the original speed. 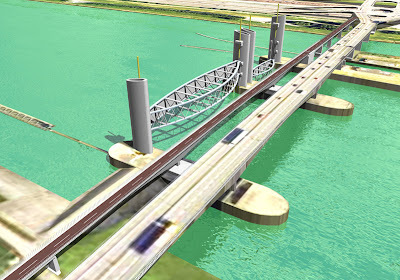 The province of South-Holland opened a website about this bicycle bridge. (Dutch but Google Translate does a good job here). Why this isn't so important as you might think Exceptional infrastructure like this is always interesting to see, but what causes people to cycle in large numbers is the very tight network of everyday, but high quality, cycle routes. Boston in Lincolnshire is a small town with a population of 35000. That's just over half the population of Assen where we live. 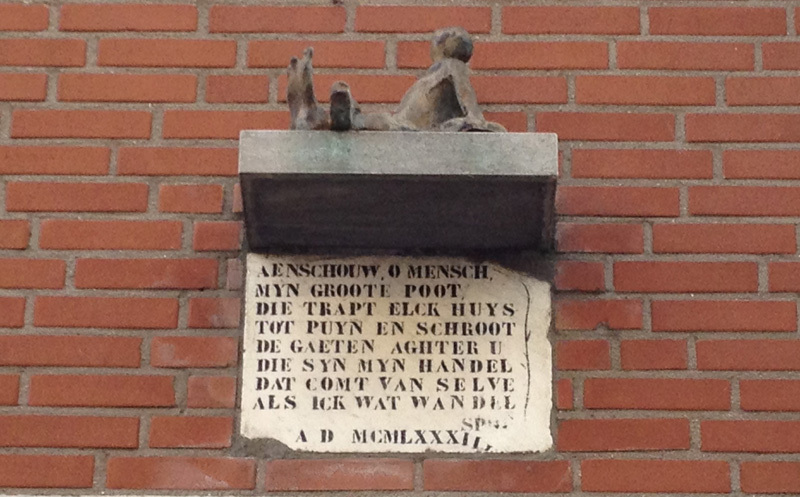 While Assen was originally a monastery in 1258, Boston claims to date back to a monastery as long ago as AD 654. Both places certainly share a long history, and many changes over the years. Both are now regional centres to which people travel from out of town in order to shop, to study or to work. For many centuries, Boston had significant trade with continental Europe and the town was influenced by European ideas. Boston has a particularly fine windmill sited next to a canal (the Maud Foster Drain). Boston is so similar to a Dutch town that Wikipedia notes that it "was used by film makers during the Second World War to represent the Netherlands when the real thing was not available for filming." "Pedestrianization" in Assen (see before and after photos). It's a very similar layout. In both cases, the "road" has been narrowed so that pavements (sidewalks) can be made wider. In both cases, different paving has been used than usual in order to make the difference between this and a normal street more obvious. However, there is one big difference. In Boston you are banned from cycling through these streets while in Assen you are encouraged to do so. Note that this video has explanatory captions which do not appear on a mobile device. You must watch on a computer to understand the video. Afterwards, watch another video which shows how the similar looking streets in Assen work very differently in practice. This "pedestrian" zone seems somewhat a misunderstanding of what a pedestrian zone is. It also is somewhat a missed opportunity to make cycling more attractive. Of course, the centre isn't the only difference these days between Assen and Boston. Boston still looks in other ways like a typical British town with, despite its small population, quite remarkable amounts of motor traffic using roads which are surprisingly large, surprisingly busy, and which direct this traffic right through the centre of the town. Cycling to the centre of Boston requires using the same roads. Pedestrians walk behind barriers and have to cross those roads using multi-stage crossings with huge delays. I've cycled along this road (I sometimes cycled to my in-laws from Cambridge when we lived there), and I can tell you that it's no more pleasant than it looks. While people who live in the suburbs of Assen cycle with very small children on their own bikes to the centre of the city, that's not what people do in Boston. People who cycle in Boston do so despite the conditions, not because of them. In Boston, like other British towns, cycling resembles an extreme sport. Roads like this, without any cycling facilities, do not encourage mass cycling. It's not the same as cycling to the centre of a Dutch town like Assen. Overwhelmingly, what Bostonians do to get about is to drive their cars. It's an easy choice to make. People may get stuck in traffic jams, which can be a problem even in small towns like Boston, they may have to pay to park (which is about as expensive as in Assen) as well as for petrol and the upkeep of their cars, and they may well complain about these costs. However, when the infrastructure looks as it does in towns like Boston, and good alternatives are not provided, then people will carry on driving anyway almost regardless of the cost as this is still seen as the least bad option. To me, this is an interesting contrast. Boston used to be part of Holland in Lincolnshire. I wrote before about how similar this area is to the Netherlands. None of the usual excuses about hills and other nonsense apply at all. The people are the same, the landscape is the same, their transport habits were once the same. The only real difference now between a British town like Boston and a Dutch town like Assen is the infrastructure. That is what explains the very different patterns of transport seen now between what were once very similar towns. 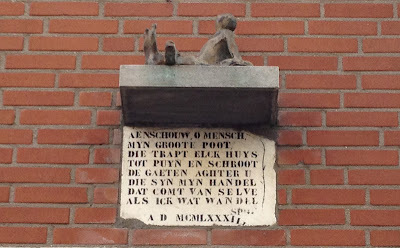 Forty years ago, Assen and other Dutch towns looked a lot like Boston, but in Dutch towns, a civilizing second revolution took place. Boston encourages driving, as well as some public transport usage. The town makes walking and cycling relatively unpleasant. The result is that people overwhelmingly drive. On the other hand, Assen encourages cycling, due to offering direct and pleasant routes for cycling. The result is that people cycle for 40% of their journeys. For Boston to reduce its car dependency and be more welcoming to cyclists requires the same kind of transformation to be made as was made in the Netherlands. It is time that British streets started to look like modern Dutch streets. Boston people could cycle just as Dutch people can. In fact, archive footage shows that before the roads across the whole country were dominated by cars, when people cycled more than they drove all across Britain, Boston's population cycled in huge numbers. See also pedestrianization in the centre of Hoogeveen, another town of a similar size to Boston, and how pedestrianization is handled in a suburb of Assen. It's of interest that the idea of running buses through the pedestrian zone was pushed through by the council in Boston even though it unpopular with many of the people. I think sometimes the public transport companies in Britain have far too much influence. I'm reminded of a council meeting which I was part of in Cambridge a few years ago at which a councillor stood up and talked about how "cyclists undermine the bus service" and that this was a reason not to provide good cycle access to a proposed Park and Ride site. 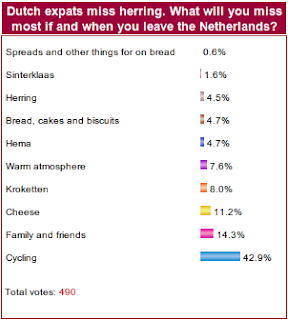 An online TV station for Dutch speaking people who live and work in other countries recently ran a survey to ask what Dutch people most miss about their homeland. The winner was Herring, which people like to eat raw. However, "Cycling" came in at sixth place overall. This was presented in the results as 6th of out of ten. Actually, "Cycling" came in at 6th out of 213 categories nominated by the public, and another ten related categories helped to water down the "cycling" vote. The other ten categories about cycling were "The bike", "Cycling without a helmet in the dunes", "Cycle-paths", "Mostly cycle-paths and cycling", "Going along with friends and family by bike", "Wonderful cycling with a warm jacket against the headwinds", "The cycling, my bike, riding through Amsterdam", "Good Cycle-paths", "The bike", "Family, croquettes, real chips, licorice, cycling and the Dutch language". I think it's notable what sort of cycling people are thinking about. Recreational riding with friends and family; having a nice time on cycle-paths through the dunes and not just any cycle-path, but specifically good cycle-paths. Cycle-paths go together with cycling in one of the categories. i.e. to cycle you need cycle-paths. What is meant of course is the very dense grid of high quality cycle-paths as seen in The Netherlands. The practical type of bike that most people ride in the Netherlands is a factor. Helmets are not wanted. In response, a similar survey was run on the English language Dutch news website www.dutchnews.nl. This website's audience is English speaking people who currently live and work in the Netherlands. They picked up the top ten categories from the Dutch language survey and asked what people from other countries who currently live and work in the Netherlands think they'll miss most if or when they leave the country. The winning category stands out by a mile. I've mentioned it before, and I think it still remains true, that people cycle in the Netherlands because it's pleasant to cycle in the Netherlands. Dutch people taken to another place will often stop cycling because conditions don't make the experience of doing so nearly as pleasant elsewhere. People who come from another country to live here are likely to start cycling. That people cycle in the Netherlands is predominantly because of the enhanced subjective safety brought primarily by cycle-paths and also by segregation of modes without cycle-paths. It's really not "rocket science" and it's certainly not some vague nation of "the culture". The good cycling infrastructure of this country makes a difference to how people live and increases the standard of living of people who live here. You need the contrast between one place and another to understand this. I've lived in three different countries and found that each has special things to offer. 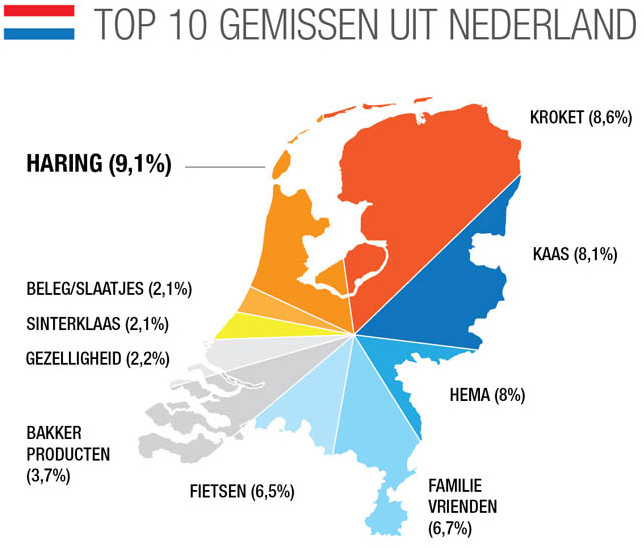 The Netherlands is probably unique in that a slice of the population not selected for being interested in cycling would place cycling in a top ten list of this sort. Of course, some Dutch people with little, or no, experience of living in other places take what they've got here entirely for granted. They really don't know how lucky they are. The website also carried out the same survey for Belgian people. In Belgium, frieten (chips / fries) were the winner. Cycling did not appear in their top ten. However this is not surprising. The Belgians don't cycle anything like so much as the Dutch do so they won't miss it so much either. Every country has things which people miss. Beer and really good Indian vegetarian food come top of my list of things that I miss from the UK. It's been decades since I lived there, but I still miss the weather from the New Zealand. The Netherlands has its high cycling modal share despite the weather, not because of it. 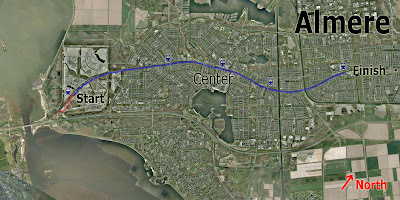 Spoorbaanpad is a 12 kilometer (7.45 miles) long fast cycle route in Almere. According to a site about fast cycle routes in the Netherlands it is the longest urban cycle route of th﻿e country used by 21,000 cyclists per day. The name means ‘Rail road path’ and refers to the fact that it follows the rail road for its entire length. 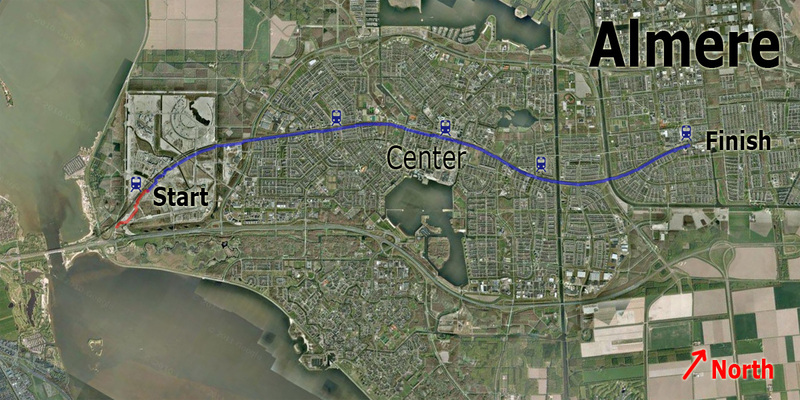 I visited Almere for my series of modern fast cycle routes in the Netherlands. 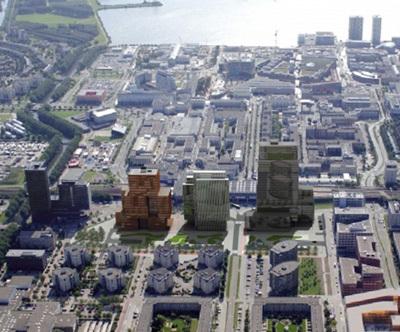 Almere is the youngest city of the Netherlands. Last month it was only 35 years ago that a handful of people got the key to the first permanent homes. Almere grew rapidly from the first 50 people in 1976 to a city of 190,000 last year. Putting it in the top 10 of largest cities in the Netherlands. By 2030 the city will have an expected population of 350,000 making it the 5th largest city. Almere is so young because it was founded on reclaimed land: sea bottom not 50 years ago. After a ring dike was finished in 1967 the area was pumped dry by 1968. The first trees were planted in 1969 but most of the city is from the 1980s. That makes almost all in the city not much older than 30 years and everything was designed, including of course all infrastructure. Almere city centre, not your typical Dutch city. From right to left just behind the tall buildings you can see the elevated cycle path "Spoorbaanpad" next to the also elevated railway. The infrastructure was designed following the Dutch principles of segregation. Traffic with a different speed, mass and direction is kept apart from traffic with another speed, mass and direction to improve overall road safety. Since this city was literally started from a blank canvas the principles could be followed 100%. through roads and connector roads for private motorised traffic only. 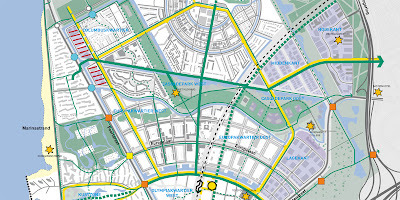 The four different grids; black dotted line, rail road; green (dotted) lines: cycle paths; yellow lines: bus tracks; thick gray lines: private motorised traffic only, thin gray lines: shared space motorised traffic/bicycles. Note how direct the cycle/bus routes are and how indirect the routes for private motorised traffic. Most of the crossings of these grids are multi-level. Unfortunately the bus track crossings for cyclists are all level crossings but they are traffic light controlled and these lights are green for cyclists most of the time, unless a bus arrives. Cyclists also cross most of the main roads at a different level. There is just a handful of level crossings with motorised traffic. Only the end-destinations, the small low speed residential streets, are shared space for private motorised traffic and cyclists. But there the speed differences are almost eliminated because these streets have a speed limit of 30 km/h or 18mph. Spoorbaanpad, a look into how it is used, the final 90 seconds show the biggest crossing and the interaction between motorists and cyclists. Some details tell us the route is already a bit older. The width is not consistent for all of the route and neither is the surface. The level crossings with the bus tracks almost seem a design flaw. Even though the route crosses the bus tracks only about 5 times, I had to stop twice for a bus and that is a bit odd for a "non-stop cycle route" to say the least. But one junction is even stranger, a crossing with a main road near the end of the route. It is the only crossing where cyclists do not have priority over motorised traffic which is inconsistent with the principles of a modern fast cycle route. The last 90 seconds of the first video focuses on this crossing because something strange happens there. Even though the cyclists do not have priority here, they do get it most of the time. Here we see the other Dutch road safety principles of predictability and forgivingness at work: since drivers know exactly where the cyclists want to go they are willing to be courteous. Not very strange because the design of the junction (with large speed bumps for drivers) also implies cyclists could have priority. It is interesting to see most cyclists respond just as friendly with a ‘thank you gesture’. in the east of Almere. More info on Almere on Wikipedia (where you can also see that Almere and Milton Keynes in the UK are twin towns) and a page with pictures of the (sometimes) exceptional architecture. This is the second fast cycle route I covered. The first was the inter urban route between Breda and Etten-Leur. Think your travel distances and times too great for the bike ? Dutch commutes are the longest in Europe. People continue to claim that the Dutch cycle more frequently than people of other nations because Dutch journeys are shorter than those of whichever country the claimant happens to live in. However, this idea that somehow the shortness of journeys in the Netherlands is the reason why the Dutch cycle more than people of other nations is simply not true. A recent report reveals that "On average Dutch people spend one and a half hours en route each day. That is 15 minutes longer than the average time on the road for citizens of 16 EU countries, and it is also the longest." Yes, you read that right. The Dutch travel for more time every day than people of other European nations. What's more, "Holland has, at 92%, the highest percentage of the total population traveling daily and France has, at 72%, the lowest percentage." The report also mentions that "In most East European countries, traveling by public transport takes up 20% of all travel time." This reinforces something that I blogged about a few weeks back. The choices that people make about transport are in large part determined by the wealth of the nation they live in. Local public transport (i.e. the bus) is not an option that people will easily be convinced to take if a private form of transport is available. However, that private form of transport can be a bicycle rather than a car: "Of the 91 minutes that the Dutch travel on average per day, 17 of those minutes are spent on the bicycle (19%). The neighbours i.e. the Belgians and Germans, cycle on average only 5 minutes per day, and other Europeans cycle even less. In the Netherlands, Slovenia and Italy, only 7 to 8 percent of the total travel time is spent on public transport." Dutch people know that they travel a lot, but, as is common everywhere, they over-estimate the difference between their travel times and those of other nationalities: "Dutch people think they commute longer than residents of other countries, but in reality things are better than they suppose. Commuters in Holland spend on average 2 minutes longer per day commuting than commuters do in other countries." Journey distances - Over what distances will people cycle ? Having established that a lack of time spent travelling isn't what makes the Dutch cycle for such a large proportion of their journeys, let's look at something else. The left cluster shows how in the Netherlands, 37% of journeys under 2.5 km are made by bike. In Denmark, 27% of them are made by bike. In Germany 14% and in both the UK and the USA, 2% of journeys up to 2.5 km are made by bike. The second cluster shows the figures for distances of 2.5 km to 4.4 km. In this case, the numbers are 37%, 24%, 1% and 1%. The third cluster of bars is for 4.5 km to 6.4 km. At this distance, 24%, 15%, 7%, 1% and 0.4% of journeys are made by bike. 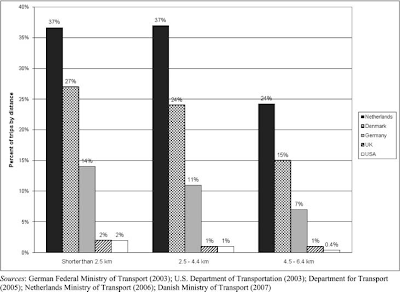 Journeys of between 4.5 and 6.4 km are cycled 60 times as frequently by the Dutch as by Americans. 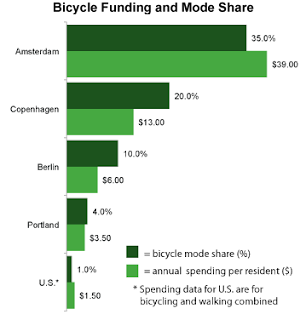 The Dutch cycle considerably more than people in other countries which spend less on cycling infrastructure. What keeps people from cycling is not distance. Rather, people won't cycle even for short journeys if the cycling experience is not pleasant. How likely the general population is to cycle correlates very well with the level of expenditure on cycling infrastructure. The Netherlands, Denmark and Germany all spend more than average on cycling, and the result is that their populations are more likely to cycle for short journeys than people of other countries which spend less. 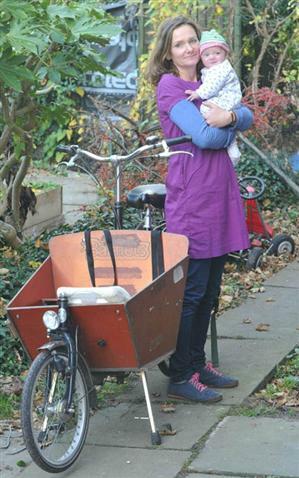 In The Netherlands, everyone feels comfortable to cycle, including children, older people and those with disabilities. People make a huge number of cycle journeys each day. 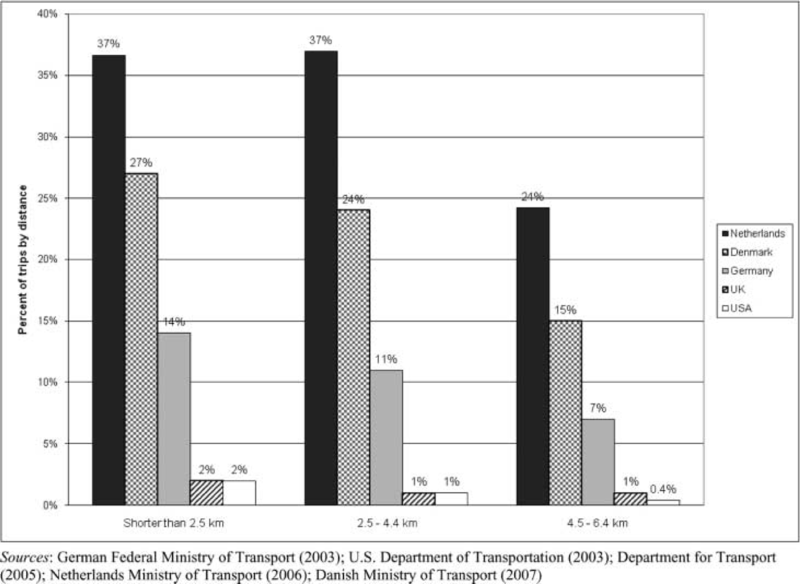 In the UK and USA, only a tiny proportion of the population choose the bike even for the very shortest of journeys, and by the time you get to the 4.5 km - 6.4 km journey length, the already very small participation has already shrunk to a half or a quarter of what it was for the under 2.5 km journey length. Other excuses are summarized here. It's been pointed out to me that some people are misinterpreting the words "Of the 91 minutes that the Dutch travel on average per day, 17 of those minutes are spent on the bicycle". This does not mean that every Dutch person has a multi-modal commute. It simply tells you how much commuting is by bike vs. other modes. In the Netherlands, just like most other countries, people do what is most convenient for them. For that reason, they mostly do not have multi-modal commutes. Most commuters use one mode for their commute, either walking, cycling or driving the whole way from home to work. Other commuters combine short journeys by foot, by bike or in a car with public transport, but these commutes are counted only as public transport commutes. Dutch railway stations do provide a lot of cycle parking in order to support combining bikes with trains, but the total capacity of the railway system is not particularly high in the Netherlands. If you live in a place where trains have standing room only during commuting times then you probably have about as much multi-modal commuting as is normal in the Netherlands. 2013 update. Do the Dutch make long journeys by bike ? One of the other common myths about The Netherlands is that all Dutch bicycle journeys are short. This is far from the truth. As in most countries, people are more likely to choose a bicycle for a short journey than for a long journey. Figures show that a remarkable 34% of all journeys made in the entire country over a distance of under 7.5 km (5 miles) are made by bicycle. However, the figures also tell that 15% of journeys over a distance between 7.5 km and 15 km (9 miles) are by bicycle and that 2% of all journeys over 15 km are by bicycle. Now 2% isn't much, but even selecting just these longer journeys, cycling has a higher share than many countries do of all their journeys by bike. The Dutch cycle longer distances far more frequently than do people of other nations. A later blog post demonstrates how Londoners use cars for journeys of the same lengths and for the same purposes as Dutch people use bikes. The graph came from "Making Cycling Irresistible: Lessons from The Netherlands, Denmark and Germany", by John Pucher and Ralph Buehler. I've started a new blog. It's to support customers of the Dutch Bike Bits webshop. On this blog there will be articles about the products that we find good enough to use ourselves and good enough to sell in the shop. There are twelve posts there so far and the latest is about the new Philips range of bicycle lights. For years I've enthused about the Busch und Müller range of lights due to their high brightness and excellent optical design. My IQ Speed was the first light with which I felt confident to cycle at 40 km/h through darkness. While the B und M lights are still very good, the Philips range now offers better performance for a lower price. For more details and a comparison between the different models, please see the blog post. The Cambridge Evening News reports that a family is considering giving up cycling in the city due to the danger, saying that it is 'worse than taking part in "dangerous sports" (a comparison which I made before). I know the feeling. It was realising the level of danger which our children faced when they cycled on the streets of Cambridge, and comparing with the utterly different reality for children in the Netherlands, which caused us to give up not cycling, but Cambridge itself, and that's why we moved from that city four years ago. The part of the article which struck me most was this: "There have been 43 accidents involving cyclists on the road from January, 2006 to September this year, according to figures from Cambridgeshire County Council. A spokesman said: 'These are average figures for similar roads in Cambridge.'" To me, an average of eight cyclist accidents per year on an average road in a small city is not a very good record. By comparison, the most dangerous junction in the whole of the Netherlands has been the site of 14 incidents involving injury in three years. In the Dutch instance we're looking at something exceptional. There is nowhere worse. This location has 14000 cyclists per day riding through it (vastly more than the junction under discussion in Cambridge) and the under five injuries per year which it causes are not just for cyclists but for all road users. i.e. a fairly normal junction in Cambridge is at least 70% more dangerous for cyclists than the very worst location in the whole of this country, even without taking into account the far lower number of people who cross that Cambridge junction by bike. The huge improvements in safety for all cyclists in the Netherlands started with protests about the safety of children. Nowadays, the Netherlands has not only a staggering amount of cycling, by all sections of society, but also the safest cyclists in the world. Britain could take note from this, and transform conditions for all. Cherry Hinton Road roundabout, where the incident occurred. A terrible roundabout design completely unsympathetic to the needs of cyclists. I've cycled here. It's very unpleasant. (Bigger map). Roundabouts simply shouldn't look like this. Dutch roundabouts are designed in a very different way, and cyclists are much safer using them. Joe Dunckley also wrote about this. Read more about the problems facing British children. Click here for The Truth About Cambridge or all posts about Cambridge. While the "everything is good" people and those whose reaction to this story could be summed up as I cycle so you could cycle too might try to convince you otherwise, the city has much to learn from Dutch practice. Historic city centres and modern traffic do not go together well. All the functions of city life compete for a part of the limited space that is available in the old streets. In many places there is no question that private motorised traffic gets a large chunk of this limited space. But in many cities in the Netherlands that is not true anymore. The big shift in thinking about allocating public space took place in the 1970s. This had big consequences for cycling too. Many cities in the Netherlands are very old. The street patterns of these cities developed in a time when traffic was very different. For centuries pedestrians, the occasional carriage and freight barrows didn’t pose many problems in the largely narrow medieval streets. But in the early 20th century this changed. Mobility increased and the vehicles that were used in higher numbers changed. Trams, bicycles and later motorised vehicles made drastic measurements necessary. For example in Utrecht where from the 1920s some through streets were widened by demolishing whole blocks of buildings on one or even both sides of those streets. This was even before the advent of the private car. Potterstraat was one of the first streets in Utrecht to be widened. In this 1960s picture the 800 year old street has a four lane road, today no private motorised traffic is allowed here. The development of this street serves as an example in the video with this blog post. When after World War II the increasing number of private cars became a big problem in the streets, the solution was again sought in widening those streets. In stead of a single street the whole fabric of the city was now targeted. It took decades to make plans and then to execute them. The number of houses that had to be removed was enormous but the people of the 1950s and 60s had different views on the historic value of cities. To them it was a blessing to get rid of the old dark homes that were almost falling apart anyway. The new wide streets with fresh light modern buildings were welcomed. But when the large scale demolitions were taking place several things became clear. The new streets were good for the flow of traffic but not good for people. It isn’t pleasant to be in a street with tall buildings and heavy fast moving motorised traffic. Also the whole appearance and atmosphere of the city changed. In the 1970s there were gaping holes all over the city of half finished street widening projects. Ironically the open places were all used as temporary parking places. But times were changing. People began to see the value of the historic buildings. The human scale of the old streets was appreciated much more when the wide windy streets of modernism became ever more present. They were hard to cross for pedestrians as well. And it became very clear that the scale of motorisation was so large that the old city centres couldn’t be adapted to it. If you demolish the whole city for the flow of traffic what destination for that traffic would be left? 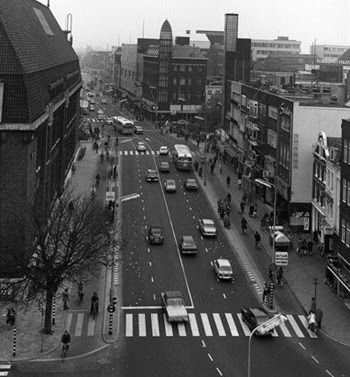 Utrecht, Korte Nieuwstraat in 1968. Centuries old homes had been removed for the plans of a big through street here. It never came. Today the street is restored, new apartment buildings came in place of this temporary parking lot. The 1970s became a turning point. A new generation of decision makers scrapped the old plans and the exact opposite was done. In stead of changing the city streets for through traffic, through traffic was gradually completely banned from the city centres. Large pedestrian areas with shops were created. Making these areas places where people wanted to be. Private motorised traffic was diverted wide around these streets. Large parking buildings were built just outside the city centres so cars would not have to enter them, but people could easily reach the shops and other destinations on foot. Removing parking from the centres in itself already decreased traffic enormously. Not every street had to be made car free. By blocking just a few key streets cities were divided in ‘compartments’ with only one or two entrance streets. This makes every destination reachable by car but rat races are impossible. As a bonus the blocked streets remained usable for cyclists giving them a more direct route and an advantage over motorised traffic. the shift in urban planning in the Netherlands from car centric policies to people friendly cities. Not all Dutch cities went through this development in the same way. Some cities only made plans or had only just started tearing down buildings. A situation which could easily be reversed. 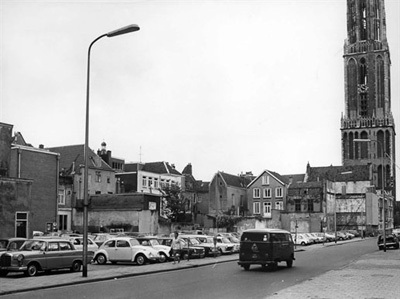 Utrecht had already demolished very many buildings. Some streets were already finished and remained wider. Other streets were reconstructed to their original width. New buildings were built in a similar scale to what had been removed earlier. The more recent the reconstruction the more ‘historic’ the replacement buildings appear to be. To the trained eye the scars in the tissue of the city remain visible but it is good that the “car-first” thinking is a thing of the past. Modern urban planning makes the cities much more livable and it also gives the bicycle much more room. I had previously made another video in which the 1950s and 60s road widening plans of Utrecht were shown. You can find it in this blog post. In the 1950s and 1960s many cities in the Netherlands had plans for the 'improvement of traffic'. If the plans in my hometown 's-Hertogenbosch had been executed, the 17th century home I have been living in for 16 years now would have been demolished sometime in the 1970s. To make way for a through street. It is a strange sensation to see your property marked as 'to be removed' on a 1960s map for 'city improvement'. Luckily the plans in 's-Hertogenbosch never made it passed the drawing board.